Read about Greece’s Pythagoras, who developed a mainstay of geometry—the Pythagorean theorem. Transport to a time of aqueducts and public baths. Suffer death by hemlock with Socrates. Get a glimpse into the lives of Leucippus and Democritus, who postulated material is formed of atoms. Smell frankincense perfume and relieve pain with myrrh. This book of narrative non-fiction will appeal to readers who love an entertaining true story with relevance to today’s world. GLOBETROTTER : Traveling author visits the Roman forum in Italy. Life today parallels history. Chemical and biological weapons were used in warfare long before any 20th century war. Cosmetics used to contain lethal substances; today some red lipsticks still test positive for lead. People share hopes and dreams that defy time and generation. This connection brings the characters of How to Mellify a Corpse to life in a poignant way. León says, “I want people to see how much like us they were. We haven’t evolved that much.” With the help of modern tools and understanding we should be able to make discoveries and conclusions of greater depth. Many discoveries from centuries ago can be used to enhance life now. 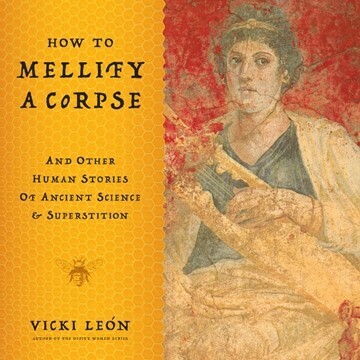 Modern science has proven the success of ancient techniques, from the embalming properties of honey to the herculean bonding power of concrete. Alexander the Great was mellified in honey and his mummy was preserved in remarkable condition for centuries. This preservation is possible because of the antibacterial properties of honey and its ability to produce hydrogen peroxide when exposed to human tissue. Coated in honey, a cadaver maintains good skin tone and human appearance. Today’s applications of this technology include storing skin grafts in honey and bandages that contain honey. Similarly, the concrete that the Romans used to construct such buildings as the Pantheon is a substance modern architectural engineers have studied and perfected. The hydrate lime and pozzolanic ash combine to make a super-strong concrete mortar that repels water, perfect for construction of modern dams. If you have ever wondered why or how a practice or law began, this book is a place to find answers. And you can tote How to Mellify a Corpse to the beach. You’ll amaze friends with anecdotes of emperors and goddesses, and very likely you’ll bring home a jar of honey for the medicine cabinet!